Nothing so enthralls the im­agination, especially the fresh imagination of a boy, as the thought of an island set far out in the lonely waste of a southern sea. Palms rise first from over the horizon's edge; then the long, low beaches of sand appear, with the surf thundering upon them; the sea-birds clatter at the strange sight of a sail; perhaps the black, sprawling ribs of some ancient wreck rise above the smothering sand, and beyond that, leading down from the tufted palms, are the footprints of a savage. Who knows what pirates have ca­reened their ships in that half-hidden har­bor, or what rough men, bearded, heads bound with red kerchiefs, pistols in sash, have there been marooned, and have stood gazing out to sea for a sail. A far-sea island is the open door to all romance. How well Robert Louis Stevenson, who was always a boy in imagination and all too briefly a man in years, knew that door. How he loved a sea island! And where is the boy who would not give his birthright to have been on the "Hispaniola" when she first sighted" Treas­ure Island"!And what is the charm of "Robinson Crusoe" and "Swiss Family Rob­inson" and" Sind bad the Sailor," of Poe at his best, and Marryat and Cooper, and all those other robust story-tellers who have made life worth living-what but a sea island! And yet not one of these giants among writers has ever, in all the ocean of imagi­nation, sighted an island more strangely wonderful than that the true story of which I shall set down in this place. For Christ­mas Island is remarkable in ways that the story-teller never dreamed of. It is an island of modern romance - the kind of romance which will absorb the interest of the boy of half a century hence. No pirates ever landed on the shore of Christmas Island, for its shores are too rough and forbidding to tempt even a hardy sailor; no barefooted savage ever left a footprint on its beaches, for until a few years ago no human voice was ever heard among its higher hills; no sailors were ever there marooned, nor gold buried. Vessels bound down through the Straits of Sunda, making for the Cocos or Keeling Islands, the pearl fisheries of West Austra­lia, or some other far place, sometimes, on the second day out, sight a patch of green rising above the horizon on the port side; and, seeing it, they sail no nearer. But vessels bound up are often borne much nearer by the trades, so that they can make out the full extent of the land - a high shouldered, green mantled island, fringed about with a white collar of surf plunging against its precipitous sides. It is about nine miles long, with a hill at each end, and a gently sloping plateau between. If the skipper has been long at sea, he knows when he sees this island, that he is just 220 miles due south of the western tip of Java, which is the nearest land, and 900 miles from Australia; and though he need water and food, he is wary about attempting to land on its in­hospitable coast. And so vessels have been passing up and down the Indian Ocean and sighting Christ­mas Island for more than three hundred years, yet knowing little or nothing about it. On a curious old Dutch chart, made by one Pieter Goos in 1666, it is given the name Moni. In 1688 that bold old seaman, Dam­pier, blundered upon this patch of green while trying to make the Cocos or Keeling Islands. He needed a pump, as he writes quaintly, and it being a calm day, he suc­ceeded in getting a boat ashore, where his carpenter cut a tree. The men brought back a load of boobies, frigate birds, and land­ crabs. The crabs evidently pleased the hungry crew, for Dampier says, "They were very good sweet meat, and so large that two of them were more than a man could eat, being almost as thick as one's leg." After that, about once in a hundred years, some captain mentioned the island in his re­ports. One sailed entirely around it, search­ing for an anchorage and finding none; an­other landed a party, perilously enough, with the intention of reaching the summit of one of the hills, but the high cliffs and the dense tropical growths turned him back. As there were no evidences of natives who might buy gew-gaws, nor of valuable vegetable or mineral products, the island was left in the mist of obscurity. Even those great island hunters, the Dutch, never thought it worthwhile to raise a flag upon it; for how could they know its value? 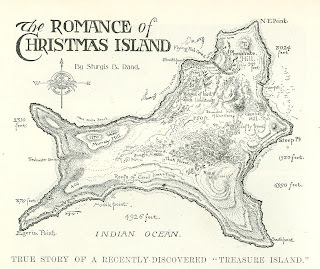 Thus time reached the latter half of the nine­teenth century, and the only thing this grim spot in the Indian Ocean had earned was a name, Christmas Island, the very origin of which is lost in the lore of ancient log-books. Then came scientists, dropping leads into the sea - idly, the practical man thought - to see how deep the water was, and they learned the first curious thing about Christmas Island. They found that the shore of the island was in fact the side of an enormous submarine mountain; that when they let their lines down, even near land, there was "no bottom," so far as ordinary soundings were concerned; and that two miles away the water had a depth of over 6,000 feet, or nearly one and a fifth miles. But even that was not the base of this huge mountain. To the north lay the awful sea valley known as Maclear Deep, nearly four miles below the summit of Christmas Island; and to the south was that other valley, Wharton Deep, with a depth nearly as great. Should the water be suddenly swept from the Indian Ocean, Christmas Island would loom up from the sea bottom around it higher by far than any mountain known to man. And on all sides its peak would be unscalably steep. All of this evidence of a great new sea mountain came to the hands of the British scientists who made the famous expedition in the "Challenger," and the chief of these was Sir John Murray of Edinburgh, Scot­land. Judging from all obtainable reports, Sir John concluded that this mountain of the sea had once been entirely submerged; that, vast as it was, it had been heaved upward several times until over 1,000 feet of its bulk reached out above the water; and that, while submerged, coral animals and plants had built upon it and covered most of its peak with their skeletons. Here was a good opportunity for studying a unique coral island; and Murray, as well as other British geographers, were anxious to take advantage of it. Accordingly the surveying ship, "Flying Fish," Captain Maclear, which was about to make a voyage in the Indian Ocean, was ordered by the Admiralty to visit Christmas Island. 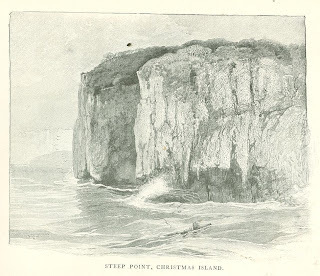 In December, 1886, Captain Maclear first sighted the island from the north. 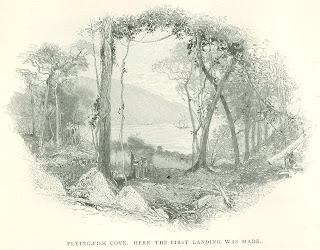 It seemed everywhere rugged and forbidding, with high cliffs un­dermined with surf, and no bottom for anchoring; but after sailing and sounding entirely around the island, he discovered a small bay with a bit of white beach, to which he gave the name "Flying-Fish Cove." There, by letting his anchor down deep and tying to a tree on the land, he secured his vessel, and sent a party ashore. And then he learned another strange thing concerning the island. All about it swarmed multitudes of birds, some of the sea and some of the land; and so unaccustomed were they to the presence of man that they flew about the heads of the sailors and allowed themselves to be picked from the ground or the trees like pet chickens. If a sailor wanted a good dinner, he had only to wave his red handkerchief and shout, and all the birds of the air flew about him clamoring, and he took his choice. Maclear's men pene­trated a little distance into the jungle which everywhere clothes the island with tropical green, and to their surprise they found everything overrun with robber-crabs and huge rats of an unknown species - ­rats so fearless that they ran over the ex­plorers' feet as they advanced. There were also large fur-coated bats flitting about in the shadows of the forest and making a great noise. A splendid large fruit-pigeon as abundant, and could be taken with the hand from the trees. Everywhere stretched the virgin forest, never before entered by man. Indeed, as science has concluded, this is one of the few instances, if not the only instance, of a tropical island of any large ex­tent which had never known man's hand, and it was therefore of supreme interest. There was virgin territory in which life had de­veloped, knowing nothing of the influence of that great changer and developer, humanity. How did it become peopled with animals and plants? And what would be the effect if man should introduce the dog, or the cat, or come to live there himself? Captain Maclear had intended to make exploration of the interior of the island, but the cliffs were so steep and the jungle was so thick that he gave up the attempt, believing that the island had little value. He tried one experiment, however; he left a number of barn yard fowls on the island, thinking they might breed and multiply greatly. But the undisturbed life of centuries was not to be so easily intruded upon. At Captain Maclear's sailing, his men reported that the land-crabs - the huge, horrible creatures of the jungle - were chasing the fowls; and the next year an expedition, hopeful of chicken pie, found not a bone or a feather of a fowl remaining. 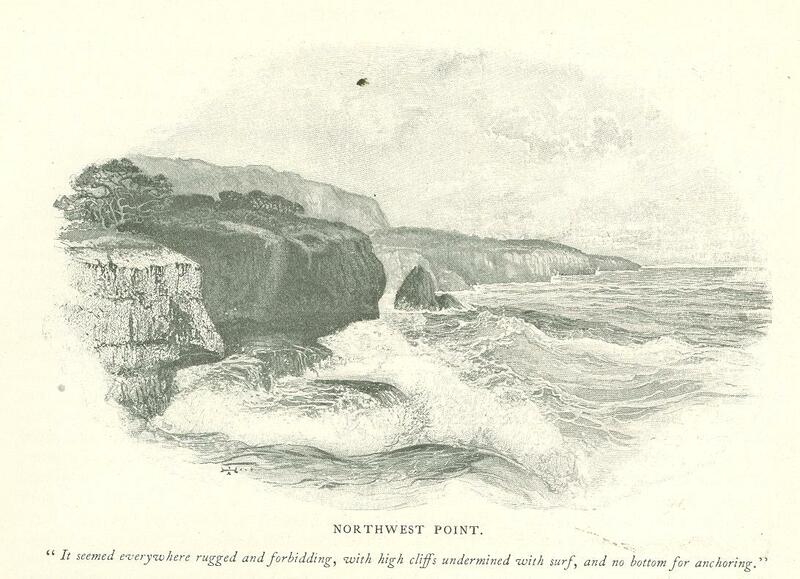 Captain Maclear's visit whetted scientific interest in the island without satisfying the desire to know more of the geological for­mation of its higher and more inaccessible parts. Consequently Captain Aldrich of the surveying ship "Egeria" was ordered the next year (1887) to make another and more persistent attempt to discover the island's secret. Aldrich had been one of the "Chal­lenger" men, and was a personal friend of Sir John Murray. 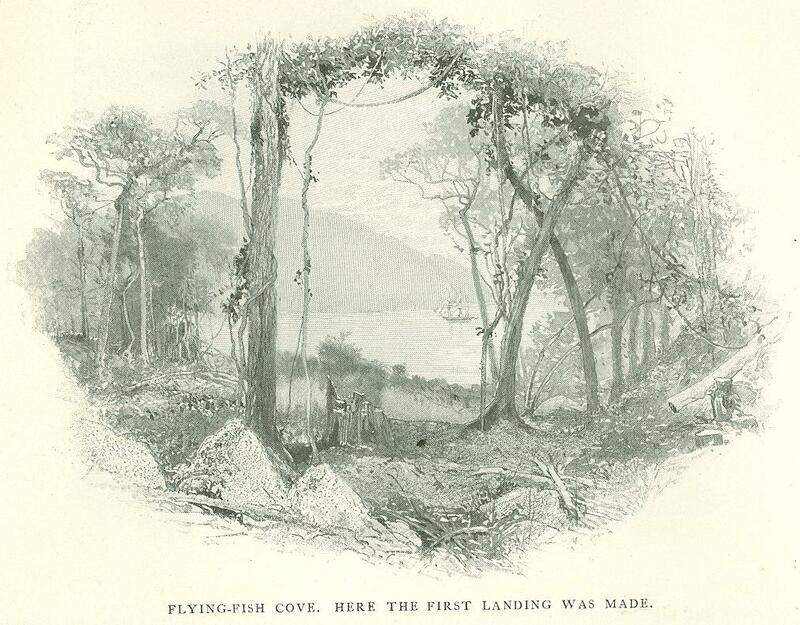 On September 30, 1887, the "Egeria" dropped anchor in Flying-Fish Cove. Two lieutenants were sent ashore, and they began at once the difficult and wearisome task of climbing the cliffs and penetrating the jungle. They found a dense growth on the steep hillsides, and the climbing was all the more difficult and dangerous because the ground was made up largely of masses of coral limestone, worn into holes, the edges of which were often very hard and sharp. It was like walking on knife blades. At an elevation of some 600 feet the travel­ing became much better, and the jungle was not so thick. The next day Captain Aldrich himself landed and followed his lieutenants, afterwards spending a night in the jungle. "It was dusk when we reached a spot on the ridge and camped for the night," he writes. "About eleven P.M. a breeze sprang up, and it was quite cold enough to enable us to enjoy a good blazing fire, which we had no difficulty in making from .the large amount of dry wood round about. "When we first arrived, the huge crabs came about us in large numbers; in fact, they swarm all over the island, so far as we saw it, and when halted for a few minutes one hears them approaching in all quarters. These are of a bluish-yellow color, with large claws and out starting eyes, and most offensive to look at. At dark these crea­tures apparently ceased roaming about, for we neither saw nor heard any of them. We were not without company, however, for the rats came out and were as abundant as the crabs. I shot a couple, and two were killed with one blow from a stick, and very many more might have been got had we thought it worthwhile procuring them.
" We brought hammocks with us, and slung them under the trees; mine was between two and three feet from the ground, and three rats, I know, came over me as I lay in it; how many more when I was asleep I have no means of telling. We could well have used a blanket, but they would have added too much to our weight for carriage. "There was a wonderful paucity of insect life; I had hoped by watching to have secured some by means of a light which I had placed on a fallen tree, but a close study for two hours produced only one small moth. It was very still in the bush; beyond the rustling of the trees and the expressions of certain differences of opinion among the rats there was no sound." Captain Aldrich spent ten days in Flying­ Fish Cove, and when he came away, he brought with him numerous specimens of rock from various elevations in the cliffs as well as from the summit of the hill. He had no idea that he had secured anything valuable. On the return of the "Egeria" these geological specimens were turned over to Sir John Murray, and he and his assistants began making analyses at the "Challenger" laboratory in Edinburgh. The early reports showed that the rock was almost pure carbo­nate of lime, revealing no evidence of its orig­inal coral formation; a fact confirming Mur­ray's theory of the formation of the island. But one day the chemical assistant appeared with a bit of rock which he could not make out, and a more careful analysis was ordered. To the astonishment of every one the bit of rock was shown to be almost pure phosphate of lime - a compound of the greatest com­mercial importance, used the world over for fertilizers and for other purposes. The na­ture and condition of the specimens led Sir John to believe there were large deposits of this most valuable substance on the island, and he sent at once an expedition under Dr. Guppy, R. N., to explore the island more thoroughly. So far as Sir John could dis­cover, it belonged to no nation, nor had any individual ever laid claim to it, for it had always been considered worthless. Strange as it may seem, the boundary line between the British and Dutch "spheres of influence" ran through the island, small as it was, so that it was within the "protection" of neither nation. Sir John at once applied to the British Foreign Office and Colonial Officeto know if he would be protected in the event that he made a settlement on the island. But Captain Aldrich's report being then in hand, and showing, so far as a sup­erficial examination could show, that the island was valueless, the Admiralty preferred not to take any further responsibility. Sir John Murray, still confident that the island had great value, although he had never seen it, succeeded in getting his friend, the late Duke of Argyll, interested in the matter, with the result that Lord Salisbury ordered the island to be annexed to the British Crown. In June, 1888, H. M. S. "Imperieuse" anchored in Flying-Fish Cove, and the day following the flag floated for the first time over Christmas Island; the British Empire had a new possession, won bloodlessly, by modern scientific methods. In the meantime it became noised abroad that gold had been discovered on the island, and other people landed to collect rocks which, on being sent home for analysis, were found to contain nothing of value. After much correspondence with several gov­ernment departments a lease of the island was finally granted by the British Govern­ment to Sir John Murray and Mr. S. C. Ross of the Cocos or Keeling Islands, and the development of the resources of the island proceeded rapidly. Today * Christmas Island is populated with men, and ships anchor familiarly in Flying­ Fish Cove. Up the cliff which once barred the way of the stoutest explorers runs a tramway - a tramway in which a car of loaded phosphate running down propels the empty car going back. Substantial houses have been built, roads constructed, wells dug, and the new residents are sur­rounding themselves with comforts. Not only has man found there an abiding place, but the plants and trees and several of the animals of civilization are also taking root in the new paradise. Coffee, cocoanut­ palms, sugar-cane and bananas, pumpkins, tobacco, corn, the date-palm, pomegranate, nutmeg, and bamboo have been made to flourish with great luxuriance on this vir­gin soil. Dogs have been introduced to wage war on the rats, which they have done with success, and a few goats, pigs, and fowls have also been imported. Unlike many tropical regions Christmas Island has a nearly ideal climate, such a cli­mate as one dreams about and rarely finds. Most of the year the weather is much like that of a dry, hot English summer, though tempered nearly always by the steady trade­ winds from the southeast, which are gener­ally cool and always pure, having blown over miles of open sea. The temperature varies only a little during the year, often less than twenty degrees Fahrenheit. The average daily maximum is eighty-four degrees Fahr­enheit, the minimum seventy-five degrees Fahrenheit. The island being high, and devoid of swampy places, and never having been contaminated by the filth of human habita­tion, it is practically free from all diseases, and the present inhabitants are astonish­ingly healthy. Rain falls only in the winter, with the exception of an occasional shower in the higher parts of the island during sum­mer nights. Occasionally the wind shifts around into the northeast, and there is a terrific storm which beats into Flying Fish Cove with much violence, sometimes de­stroying the barges employed in loading the phosphate. During these storms, many birds of passage, moths, butterflies, and dragon-flies are driven ashore in an exhausted condition, evidently having been blown over from Java or some of its neighboring islands. But, strangely enough, few of these adventurers ever survive; they succumb to the ravages of the native rats, crabs, and birds. 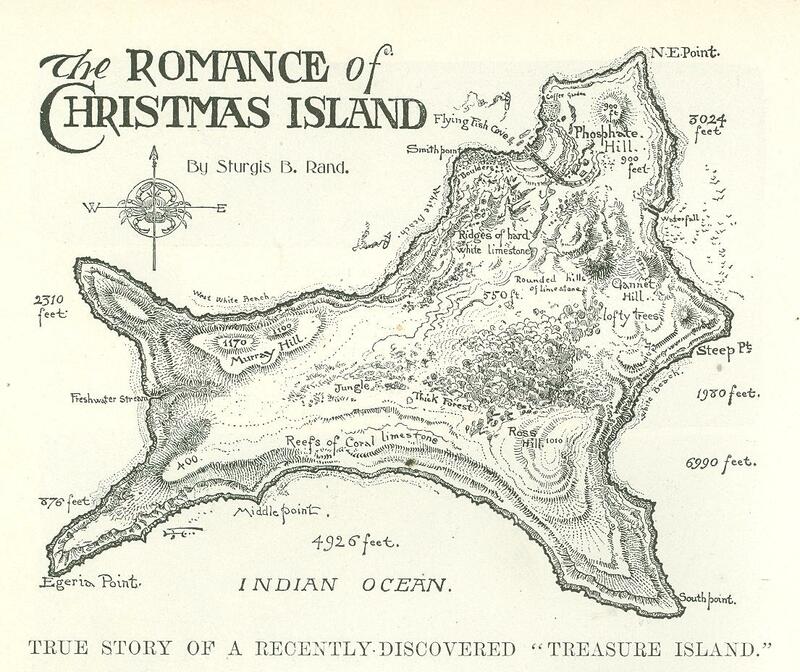 This curious freak of the northern winds suggests to science the method by which Christmas Island was originally clad with vegetation and populated with animals. Seeds were blown thither by the winds; the original rats may have come upon logs, roots, and vegeta­tion torn away from other coasts. and floated there in the storms. The sea-birds, of course, found this solitary spot a most congenial home, and it is Sir John Murray's theory that the extensive phosphate fields have re­sulted from the deposits of innumerable sea­birds when the island was only a few feet above the level of the sea, these deposits hav­ing changed the coral formation (carbonate of lime) into phosphate of lime. Thus through the persevering interest of the scientist, the British flag flies over a new possession, and the world at large has been enriched by a hitherto-unknown store of phosphate which will assist in making fertile thousands of farms 1n every part of the world, thereby increasing the production of human food. Sir John Murray is fond of using this as an answer to those practical ones who see no sense in spending money for great scientific expeditions. This one little island will soon repay many times over the expense of that wonderful voyage of the "Challenger." * Last winter Sir John Murray made. an extended visit to Christmas Island. Upon his return, in April, 1901, he wrote to the author: "I very much enjoyed my visit to the island. I did not find the animals so tame about the settlement as reported by the earlier visitors. I visited nearly all parts of the island, and in the remoter places the animals have still no fear of man. The Chinamen climb up the trees, with a fishing rod in hand, which has a string loop on the end, and pull down the pigeons sitting on the branches, one after another. If the loop is not passed over the head of the pigeon at the first attempt, it calmly waits until the second attempt is made. Nor does its neighbor pigeon flyaway!
" The island is larger than at first reported. I was the first person to walk right from one end to the other. In doing so I lost my way, having missed a 'blaze' which the coolies said they had made in one direction for six miles. I had with me an engineer and six coolies. One coolie broke down, and we left him all the food, so that for supper we had to eat the tips of the sago-palms which we cut down. A long night of rain followed, uncomfortable, but very interesting. The ground was all phosphorescent, and we could see the crabs, rats, and one small snake creeping over these bright patches on the earth. The cries of the bats, the owls, and the pigeons, and the rustling of the rats and crabs among the dead leaves were all the noises we heard, although the people at the settlement were firing guns and beating gongs. At last daylight came, and after a breakfast of sago-palm tips we started again at five o'clock in the morning, compass in hand, and reached the settlement about noon. We propose to do a lot of work on the island this year in the way of wharves, roads, houses, saw-mills, etc." Originally published in McClure's Magazine. November 1901.